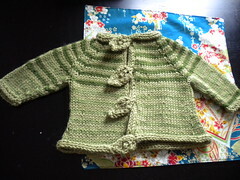 Made from vintage embroidery wool in leafy colors. 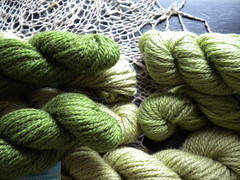 I knit a simple raglan first. Sleeve decreases don't start until half way down the arm, and I used random stripes are the arms. 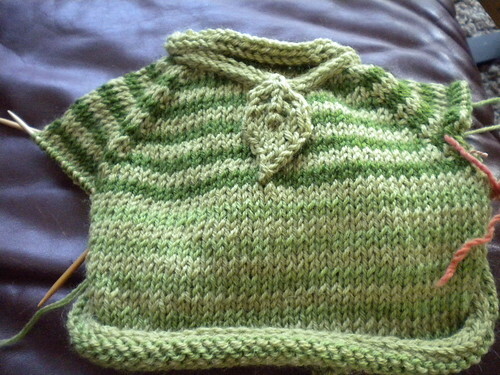 The bottom has A line shaping to help go over the bulk on pants and diaper for a baby sweater. What is a little hard to tell in the pictures is that the entire (every 2 rows) is striped, even on the bottom. 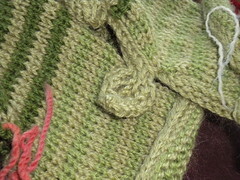 I-cord edging was picked up after (using live stitches on the beginning or ends). Each sleeve was done in plain icord, as was the top and bottom edges. Each leaf on the front was picked up and knit individually starting at the top of the sweater- creates a lot of ends to weave in! There is a leaf and icord detailing on the back too! 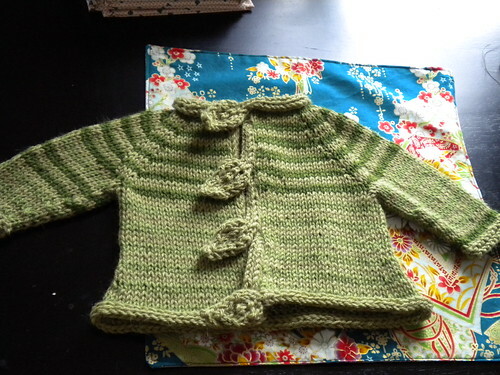 This is one of those projects I make and hang on to until I find someone having a baby- I always keep a box of presents pre knit!